For those who love to shop for kitchen gadgets, I am sure you have seen this New Philips Avance Noodle Maker (飞利浦爱面机) in major departmental stores whereby their promoter will explain its functions as well as demo on how to prepare healthy homemade noodles in just 10 minutes. 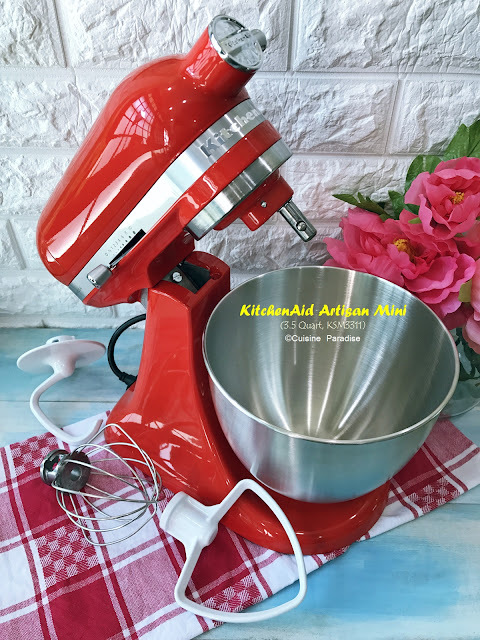 In order for us to review this appliance and test out its performance we decided to work on a few recipes using water, juice, egg and different types of flour to make noodles and pasta in various flavour and colour. After which we use the noodle to create different dishes such as spinach wanton mee, cold lemon noodle. beetroot penne and etc. To find up more details and functions of the New Philips Avance Noodle Maker (HR2365/05) you can check out our product review post under kitchen gadget section HERE. 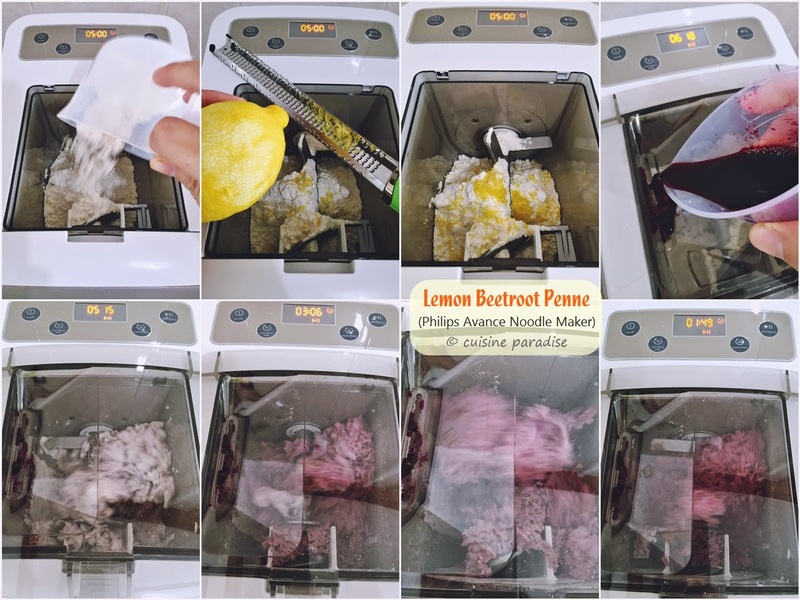 This refreshing Lemon Beetroot Penne Salad is so easy to prepare by just poaching and blanching the meat and vegetables then toss everything together with the lemon dressing. Or for a meatless version you can either omit or replace chicken breast with feta cheese for extra bites. 1. In a small bowl, whisk in all the dressing ingredients till combine and set aside while preparing the rest of the ingredients. 2. Prepare chicken breast with your preferred method (poach, boil or bake) then dice and set aside. 3. Cook beetroot penne in a pot of boiling salted water (add in pinch of salt) for about 4 minutes or until al dente. Rinse, drain well and set aside. 4. In a large mixing bowl, add in all prepared ingredients. Toss well with dressing sauce before serving. Ingredients for making lemon beetroot penne. 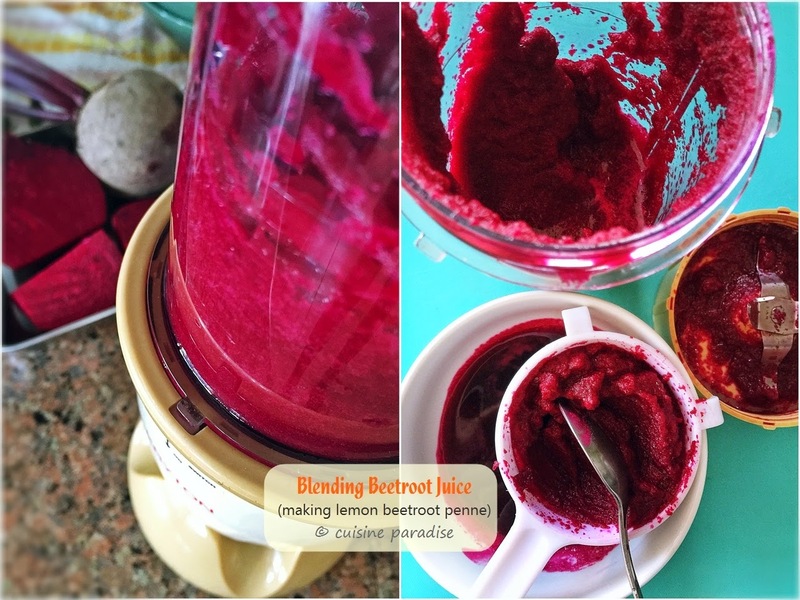 Apart from it's gorgeous colour when juiced, Beetroot has a sweet and earthy flavour which blends well with fruits like apple, carrot or lemon (recipes). So if beetroot juice is listed on your daily juice menu, perhaps you can prepared slightly more and use it for making beetroot spaghetti or penne like what we did. 1. 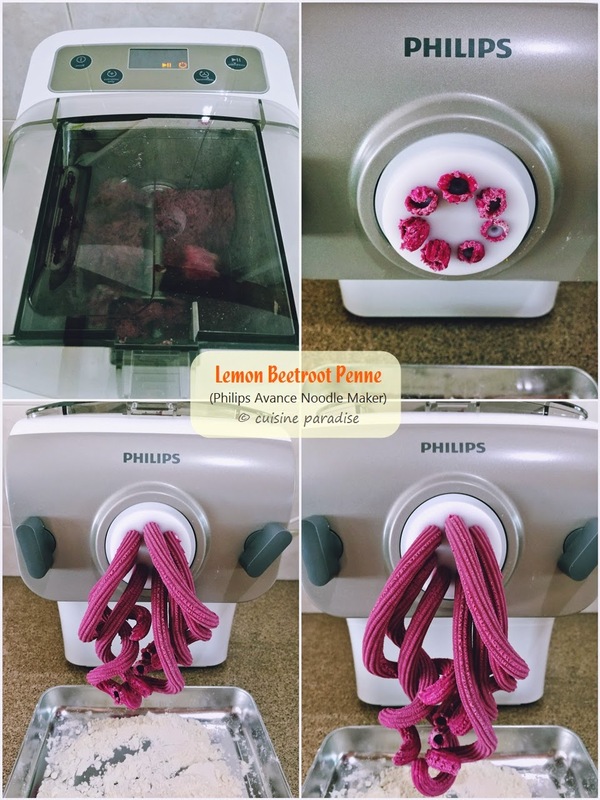 Using a blender or cold press juicer to obtain 95ml of fresh beetroot juice and set aside (I blend 2 medium (about 500g) beetroot to obtain 140ml of fresh beetroot juice). Steps on prepare the lemon beetroot penne. 2. Press the power on/off button to switch on the Philips Avance Noodle Maker. Open the chamber lid, add in flour and zest of 1 lemon. Close the lid. 4. Slowly pour in the beetroot juice along the entire length of the slot on the left side of the chamber lid. 6. Depending on the type of noodles, you can either use the flat cleaning tool or scissor to cut the noodles into desired length. 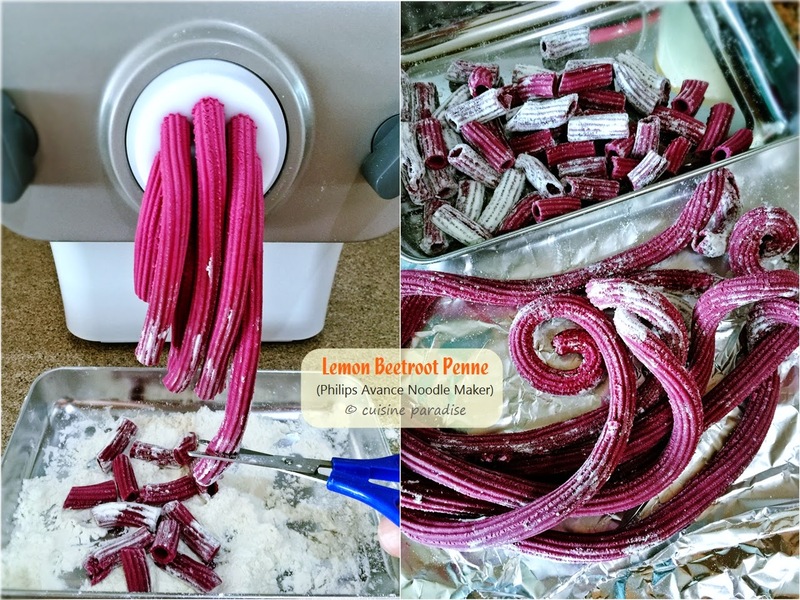 A quick demo on making the lemon beetroot penne using the Philips Avance Noodle Maker. Aglio e Olio is a traditional Italian pasta dish made by sauteeing minced garlic in olive oil and sometime addition dried red chili flakes is also added to spicy up the taste. For this Aglio Olio with Prawn recipe I used freshly made wholemeal carrot spaghetti which cooked till al dente then toss it in fragrant garlic oil (I sauteed lot of minced garlic and fresh chopped red chilli together till garlic is golden brown) to perfect the taste. 1. 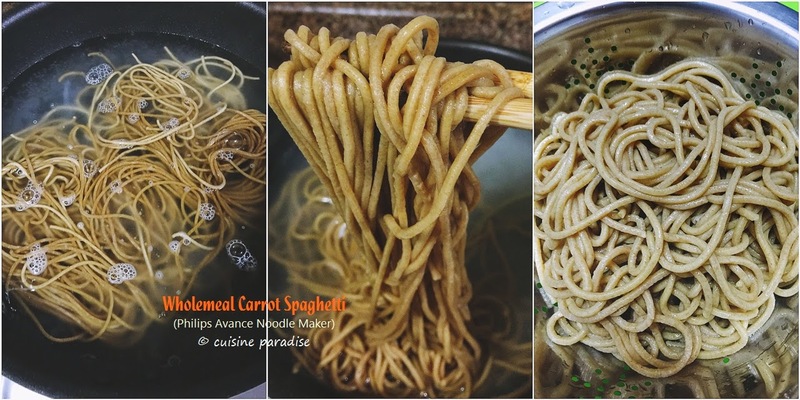 In a pot of boiling salted water cook wholemeal carrot noodles for about 6 minutes or until al dente. Rinse, drain well and set aside. 2. In a frying pan, heat oil on medium heat then saute minced garlic till fragrant and golden brown. 3. Add in prawn (shelled and deveined) and cook for 2 minutes, toss in chilli and season with salt and crushed black pepper to taste. 4. Lastly toss in drained noodles, mix thoroughly and divide equally into serving portions. Serve immediately. Ingredients for making wholemeal carrot spaghetti. Carrot juice is a delicious drink which rich in vitamins and minerals like calcium and potassium. And by having a glass (200ml) at least once/twice a week also helps to boost up the whole body making it great for skin, hair, nails as well as liver function. So for a healthier choice we choice wholemeal flour instead of the usual plain flour to go with the carrot juice to make the wholemeal spaghetti. In this way the sweet taste of the juice will help to enhance the grainy texture of the noodle making it palatable to taste. 1. 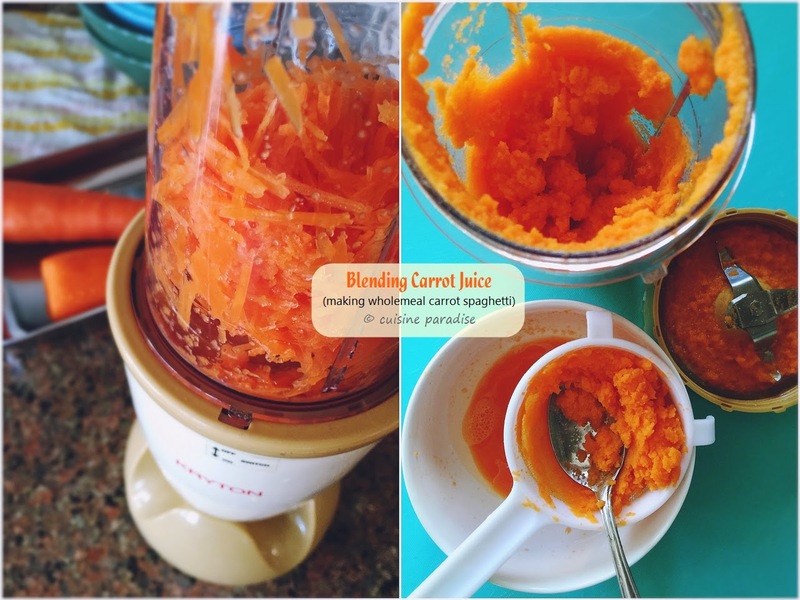 Using a blender or cold press juicer to obtain 95ml of fresh carrot juice and set aside (I blend 2 medium (about 400g) carrot to obtain 120ml of fresh carrot juice). 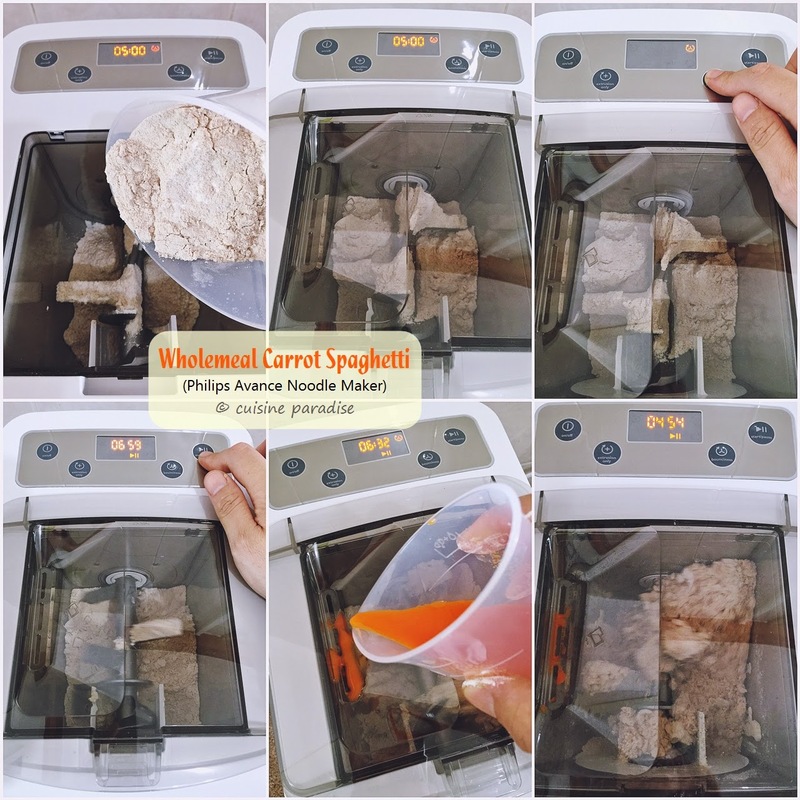 Steps on preparing wholemeal carrot spaghetti. 2. To make wholemeal carrot spaghetti; follow the same steps as shown above on the lemon beetroot penne. Add in flours into the noodle maker, set bounciness to 7:00 minutes and start the making processing. This sweet comfort Baked Pumpkin Fettuccine is perfect for after school meal or cold night dinner. The thick homemade pumpkin fettuccine is infused with egg and pumpkin taste with a lovely yellowish colour from the pumpkin juice. After which the cooked noodle is bathed in creamy pumpkin sauce made by blending the steamed pumpkin with milk for a lighter taste. You can serve the dish at this stage with some shaved Parmesan cheese or alternatively top it with shredded cheese and baked until cheese melted and browned. 2. Steamed the pumpkin until soften (about 5 minutes on medium low heat over stove), remove (set 70g aside) and cool it slightly before blending it with milk to form pumpkin puree. 3. Saute onion with butter till soften, add in mushroom and continue to cook for a minute before adding in pumpkin puree and stir it over low heat for 10 seconds till thicken. 4. Next toss in the cooked noodle and steamed pumpkin cubes (the reserved 70g cooked pumpkin), give a few stir to coat them evenly with the sauce. 5. Remove noodles into baking dish. Top with shredded cheese and tomato then bake in preheat 180°C / 356°F oven or Philips Air-fryer for about 5 - 7 minutes until cheese is melted and bubbling with golden brown patches. 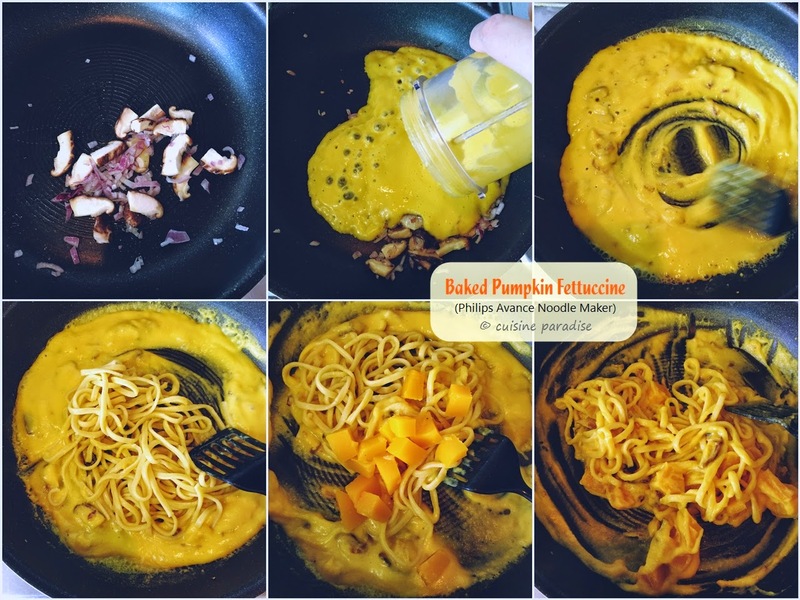 A quick demo clip on how to prepare the baked pumpkin fettuccine. Our family loves pumpkin and we often use it for our bake and dish because of its natural sweetness and smooth creamy texture. 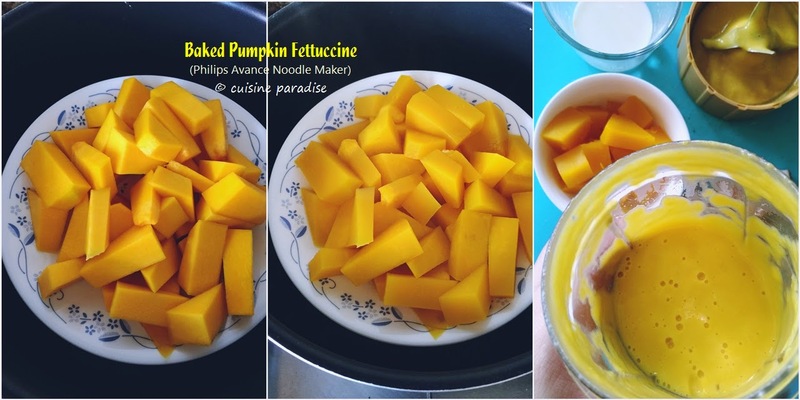 Now with my Philips Noodle Maker, I am able to add on another pumpkin recipes by making some pumpkin fettuccine which I always wanted to. You can add in some chopped fresh herb of your choice to enhance the flavour of the paste. 1. 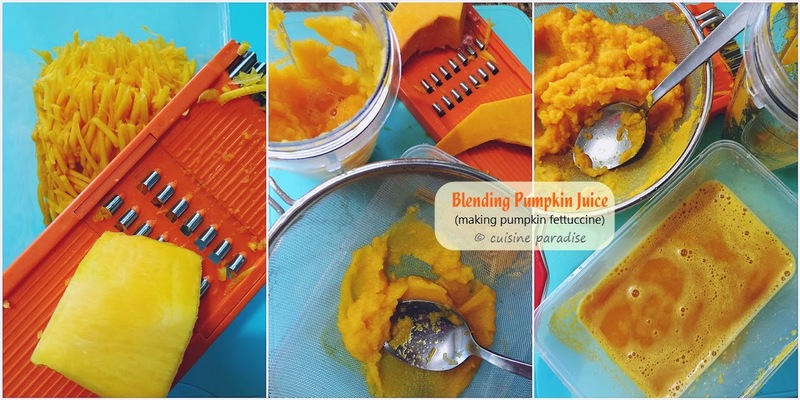 Using a blender or cold press juicer to obtain 80ml of fresh pumpkin juice and set aside (I use 1/4 wedge (about 200g) pumpkin). 2. Lightly beaten an egg shown above in the provided liquid measuring cup then add in pumpkin juice to "1 cup marking" using the Egg + Water Mixture reading. Drying the noodle by hanging it over a pair of long cooking chopsticks. 3. 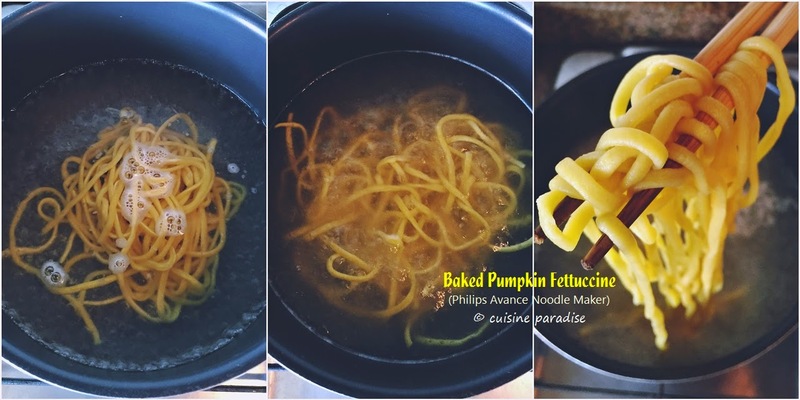 To make pumpkin fettuccine; follow the same steps as shown above on the lemon beetroot penne. Add flour into the noodle maker, set bounciness to 6:00 minutes and start the making processing. 4. When the process completed, lightly sprinkle the noodles with flour to prevent strands from sticking or dry them by handing on a noodle rack or long cooking chopsticks (about 5 minutes). 5. After which wrapped the noodles in parchment paper stock in air-tight container inside the fridge (can keep for 3-5 days). A quick demo clip on how to prepare the pumpkin fettuccine. Lastly I hope you will find this noodle making post useful and I will sharing. You can find another 3 Asian Noodle recipes featuring Spinach Wanton Noodles, Lemon Cold Noodle and etc in the next post here. 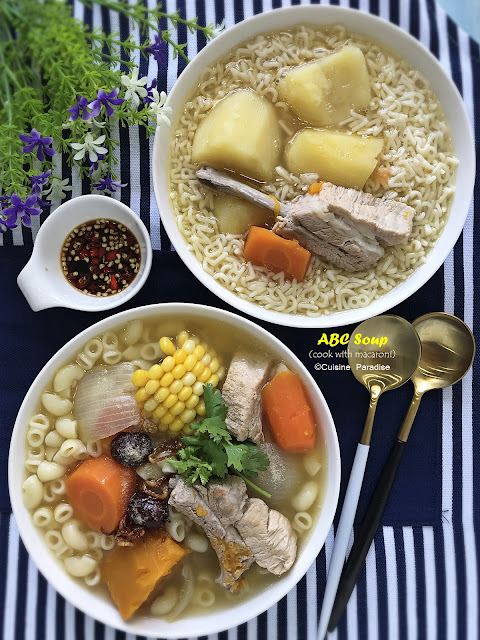 Meanwhile enjoy your week and do drop me a comment if you have any homemade noodle recipe ideas to share with us too. 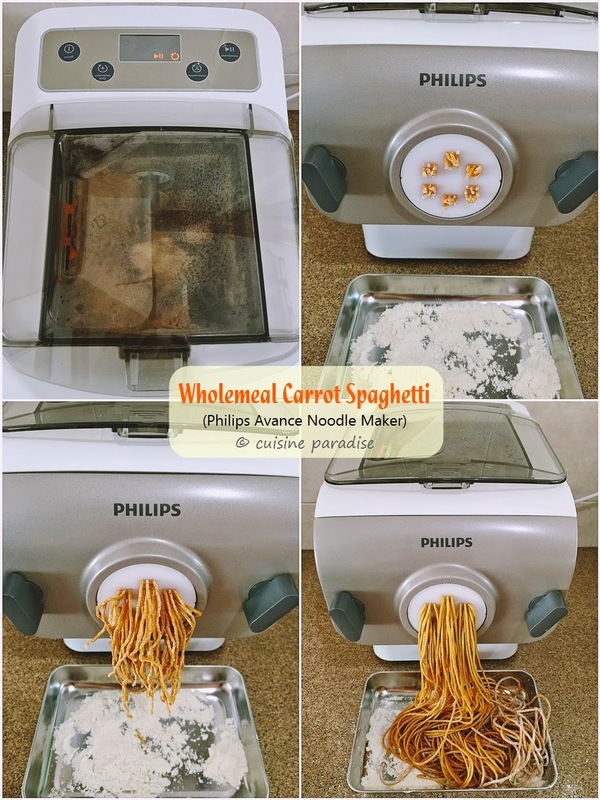 *Disclosure: I was given a set of the new Philips Avance Noodle Maker from Philips Singapore for this review purpose but all opinions expressed in this post are of my own and there is no monetary compensation received. wonder if it can udon? My dough kept getting stuck inside. I took about 30-40 mins to make the noodles and I had to manually squeeze the dough into the hole. I use all purpose flour (Bake King). Any tips ? Do you face the same problem ? When you mentioned that your dough kept getting stuck meaning there is no noodle coming out from the shaping disc or some left over dough after most of the noodle is out? Also may i know which type of noodle are you making? Hi Swee San, welcome to the homemade noodle club :) I have not tried freezing the noodles but i do keep mine in the chiller after airing it dry (wrapped with parchment paper) and store in air-tight container. It can last for about 10 days and it still taste good without any mould on it. Hey Ellena, just wondering: if I want to double the batch (ie. use 500 g flour), do you double the bounciness level too (eg. if we want bounciness level of 7 minutes: you choose 7 minutes of bounciness level and pause it once it beeps, and choose bounciness level of 7 minutes again before you let the machine extrude the noodle?). Thank you. Hi can make brown rice Hor fun with this machine?